Why Palin is "going rogue"
Sarah Palin's new book, Going Rogue, gets its title from an expression McCain staffers made about Palin during last year's presidential campaign, referring to her unscripted interviews with the media. The book is both about her time on the campaign and an autobiography. It provides a revealing look at the real Palin, off the cuff and delivering straight talk. Ironically, after the Senator known for straight talk chose her to be his Vice-Presidential running mate, his staffers tried to stifle her straight talk on the campaign. The book reads quickly. Written in Palin's no holds barred, colorfully descriptive manner, you can hear her speaking as you're reading it. She writes candidly and caringly about her five children, particularly the very special Trig. She holds nothing back, describing in explicit detail the specifics of hunting and fishing and raising babies. There is a good dose of humor spread throughout the book, such as Palin's response to criticisms of her teenage daughter becoming pregnant. "I was amazed at how many liberal pundits seemed floored by a pregnant teenager, as if they'd all snuck out and had traditional-values transplants." Palin is tremendously proud of Alaska, where she grew up, and provides a unique glimpse into the state most Americans in the "Outside" (Alaskans' name for the lower 48 states) never knew anything about. Her husband Todd is descended from Alaskan Eskimos, and due to that heritage cares deeply about respecting and caring for the environment. Although it is not a politically correct environmentalism, but one that that pragmatically includes fishing and hunting and using our natural resources like oil and natural gas. Palin is not from a wealthy family, and is an incredibly hard worker. In high school, she cleaned an office building by herself once a week, picked strawberries, and performed other jobs. She put herself through college, working seasonally in the fishing industry with her husband Todd, a job that continued years afterwards. As Mayor and Governor, she stuck to that hard work ethic, refusing to accept many of the perks that came with political office. She ran for Mayor of Wasila on a platform that included decreasing the Mayor's salary and did. She eliminated the governor's cook and would not accept most of the Governor's per diem. The list of conservative accomplishments Palin achieved in a short period of time while Mayor of Wasila and Governor of Alaska is impressive, more so than virtually any other Republican Mayor or Governor around the country the past few years. It is outrageous the mainstream media virtually ignored her record. Appropriately, she attaches as the last chapter in the book an email written by Dewey Whetsell, a fire chief in Cordova, Alaska, which lists her accomplishments and dares the reader to find anyone who can match them. From cutting government to taking on and beating Big Oil, it is clear why many consider Palin the next Ronald Reagan. The biggest expose of the book comes when she calls out her opponents and antagonists, some who, like the McCain staffers, should have been working with her, not against her. She names several McCain staffers who retaliated against her speaking unscripted to the media by leaking negative stories about her to the media. During the campaign, McCain staffers restricted what topics she could speak on, prohibiting her from speaking about any of Obama's anti-American associates, such as the Reverend Jeremiah Wright or William Ayers. One is left wondering whether McCain could have won if the team had addressed them. Perhaps his staffers were afraid that if Palin addressed anything substantial, her popularity would eclipse McCain's. At a rally in Florida which took place at the retirement community The Villages, 50,000-60,000 people showed up, more than the few thousand that were showing up at rallies featuring only McCain. Only 10,000-12,000 were expected to show up for a Vice-Presidential candidate. Ultimately, Palin has nothing negative to say about McCain, reserving her expose for mostly unnamed staffers. What she is too polite to say, but what most people intimately involved in campaigns are aware of, is that McCain could have stopped the exclusive leaks to Fox News reporter Carl Cameron coming from his staffers, but chose not to. The McCain people were looking to save face, and instead of admitting that perhaps the campaign was tanking because McCain was not the best choice for the Republican Party presidential candidate, they decided to scapegoat Palin. Palin explains why she appeared to do poorly in certain media interviews. The infamous interview with Katie Couric actually took place over a series of several interviews, and Couric cut out portions of each interview in order to make Palin look bad. When Couric asked Palin what news publications she read regularly, Palin had just finished a major campaign appearance and was irritated by Couric's condescension. Palin had submitted an op-ed earlier that year to the New York Times and thought Couric was badgering her. Couric asked her 12 questions about abortion and the morning after pill. Palin says the repeated badgering made her feel like she was in the movie Groundhog Day. Couric made fun of Palin for saying she could see Russia from Alaska, but after the show aired several Alaskans sent Palin pictures of themselves standing on the beach in Alaska with Russia visible behind them. Palin contrasts this with an interview by Couric of Palin's opponent Joe Biden around the same time. Biden said two clearly ignorant things about history during his interview, but Couric failed to call him on them, then or later. "When the stock market crashed, Franklin D. Roosevelt got on the television and didn't just talk about, you know, the princes of greed. He said, 'Look, here's what happened.'" Most politicos know or would have found out later when editing the show that FDR wasn't president in 1929, and that television had barely been invented. Palin laments, "What used to be called 'mainstream' national media are, in many respects, worthless as a source of factual information anymore." The area where Palin is most vulnerable to attack – whether by McCain staffers or the media – is her style of speaking. She hasn't refined her speaking skills to the expected level of clever soundbites and quick comebacks. She explains, "I liked my simpler style, because it meant I never had to spin, I never had to B.S., and good or bad, I never had to struggle to remember what I said last time." Most politicians who reach her level on the political foodchain develop an ability to deliver canned, catchy one-liners. Palin has stubbornly held out, preferring to give honest, from the heart answers. Only time will tell whether this hurts her future political aspirations. If anyone had any doubts as to her overall intelligence, though, this book will firmly put those concerns to rest. Her level of accomplishments could have been attained by very few. Palin provides a thorough and realistic explanation of why she decided to resign as Governor soon after the presidential campaign ended. Not only were bogus ethics charges beginning to pile up, due to her national stardom – she presents a real threat to the left - but in Alaska the governor and executive staff are required to pay for their own defense against ethics complaints, even the most frivolous. Palin was spending all of her time defending against these charges, instead of running the state, and could not justify continuing to put her staff through it as well. Palin identified the left's assault against her as methods from Saul Alinksy's "Rules for Radicals." Palin includes a lengthy section at thee end of the book laying out her conservative principles and a critique of the Obama administration. It reads like a campaign platform, and very likely was placed in there for strategic reasons. She never denies being interested in higher office, but instead is open to whatever God would like her to do. In her resignation speech, she cryptically said, "In the words of General MacArthur, 'We are not retreating. We are advancing in another direction.'" Palin's dad described it this way, "Sarah's not retreating; she's reloading!" Ever the strong Christian, and "roguely" not caring what politically correct people think about her, Palin concludes the book with a plea to accept the Lord into your life. 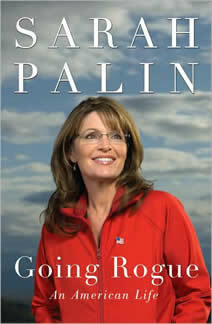 With this book, Palin has redefined "going rogue" as giving the Republican base the meat and potatoes of conservatism they crave. Rachel Alexander and her brother Andrew are co-Editors of Intellectual Conservative. Rachel practices law in Phoenix, Arizona and blogs for GOPUSA.com. She has been published in the American Spectator, Townhall.com, Fox News, NewsMax, Accuracy in Media, The Americano, ParcBench, and other publications.